Dr.Malpani's Blog: Dear Doctor, can you afford not to have a website ? Dear Doctor, can you afford not to have a website ? Today, very few Indian doctors have their own website and I find this quite surprising ! Indians are meant to be leaders in IT, and Indian doctors are usually quite smart and entrepreneurial! Let's look at some of the reasons as to why the internet presence for Indian doctors is so low. Why do most Indian doctors not see any value in having their own website ? don't have one either ? * Isn't it unethical ? Isn't it the same as advertising ? * It may be fine for some fancy doctors, but most of my patients do not use the computer, so why should I bother about a website ? * I do not understand all this high tech computer business and email, so I'd rather not get involved in something which is beyond me. I feel this is a big mistake. 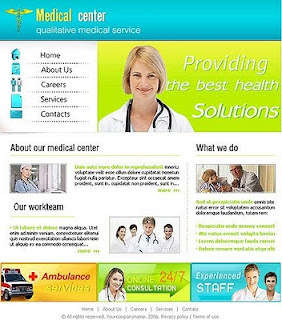 Most successful doctors in India today do have their own websites . This is especially true for high end high profile medical services, such as IVF , cosmetic surgery and dentistry. Websites serve many useful purposes. * They are an important way of acquiring new patients. These patients are usually the best kind of patients to have because they are well-off and can afford to pay. Even more importantly, you do not have to pay a referral fee or kickback to the referring doctor ! * A website is very cost effective. If you are a cardiac surgeon and your website gets you even one more additional new patient, you have recovered the cost of your site ! * Today, even if most patients do not have a PC, practically all of them have a mobile ! It's possible to reach out to them through their mobile using your website ! Times are changing - and those doctors who get left behind will have a very hard time catching up !